and Syllabus, Admit cared release date, exam date, and other details of this Mahapariksha Arogya Sevak jobs is updated below. Candidates who are interested in this Arogya Sevak Bharti they can apply online on or before 16-04-2019. 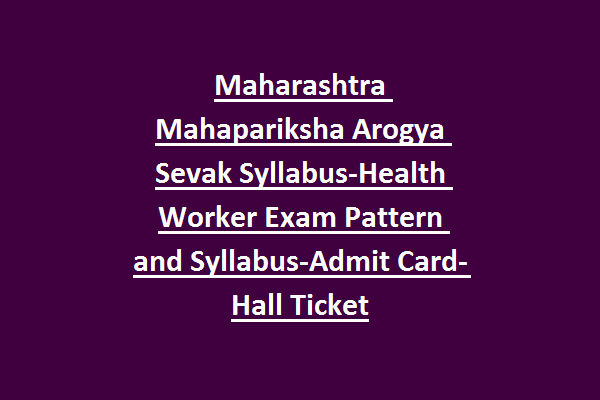 In this notification we are providing the exam pattern, exam syllabus pdf for Arogya Sevak posts along with Mahapariksha Admit Card/Hall Ticket release date. 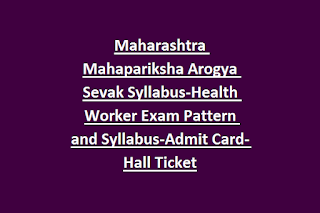 For more details about this Mahapariksha Exam Syllabus, Hall Ticket and other details check the below given information. There are more than 9000 posts in this Arogya Sevak Recruitment 2019. Upper age limit is 38 years and for reserved candidates 40 years. Candidates selection is based on written exam for this Mahapariksha recruitment 2019. Written exam will be conducted for 200 marks. Total 100 questions will be given for this Arogya Sevak recruitment 2019. Eligible Male/Female candidates can apply online through Mahapariksha official website of www.mahapariksha.gov.in. Last date to online form submission for Arogya Sevika/sevak jobs is 16-4-2019. Exam date, admit card release date and other details are updated in this website only. Eligible candidates can download admit card online for this Arogya Sevak posts through official website of Mahapariksha. Admit card/ Hall Ticket release dates will be updated later.